Stories, no matter how jagged, broken or twisted out of shape, have always been at the heart of Forced Entertainment’s work. In The Coming Storm, this preoccupation with storytelling approached something of a climax, as multiple narratives collided in a messy eruption of stage fictions. The Last Adventuresfinds the company playing in the wreckage. Core company members Richard Lowden, Claire Marshall, Cathy Naden and Terry O’Connor are joined on stage by a host of guest performers, swelling the ensemble and preparing the ground for chaos. They begin seated in a classroom set-up, repeating learned knowledge by rote. As so often in Forced Entertainment’s work, the profound mingles with the banal mingles with the ridiculous. “Some people act like animals”. “This writing is not for people”. “Time cannot be saved”. Where this new piece takes a less familiar turn is through the electronic soundscape created by collaborator Tarek Atoui and supplemented by an onstage improvised contribution from noise artist KK Null. 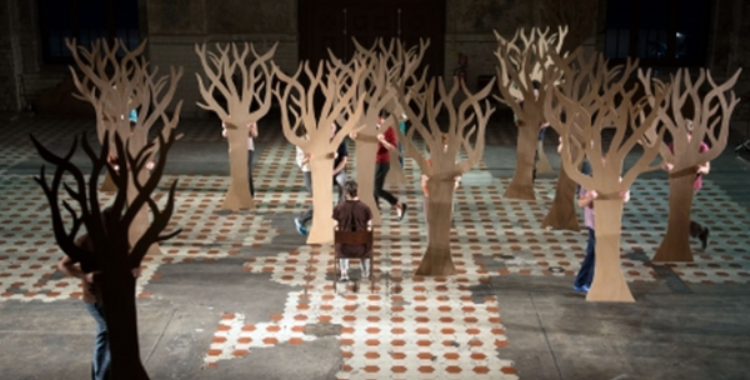 Sound rips through the lesson, drowning out the monotonous repetitions, and performers peel off one by one, collecting cut-out trees from the back of the stage. Suddenly, everything shifts. For the rest of the show, sound and image replace language. A moving forest of trees sweeps across the stage. Performers don colanders and dressing gowns, running at one another with broom handles. Noises attack with deafening force. A tree is chasing a man with an axe. A voice is trying to speak. A papier-mâché constellation of stars and planets forms and disperses. Princesses and sea monsters run past stricken soldiers. Sounds swell, shudder, jolt. This is a world of fragments and echoes, of broken off splinters of images and truncated blasts of sound. It invites the eye and ear to dance over it, selecting from its rich, cacophonous overabundance of sensory stimuli. And many of those fragments are from Forced Entertainment’s own 30 year history. Skeleton suits recall Spectacular, while a cardboard crown briefly conjures And on the Thousandth Night. If Forced Entertainment are dancing in the rubble, it is formed from the detritus of their own back catalogue. Time – as it has a tendency to in the company’s work – does funny things duringThe Last Adventures. At some moments it seems to accelerate to warp speed, while at others it painfully drags its heels. As a viewing experience, the show hovers somewhere between boredom and entrancement, its oddly hypnotic quality encouraging the mind to periodically wander and return. Each time my concentration refocuses, another image jumps out from a different corner of the stage, another story spins itself involuntarily in my mind. As something of a mental exercise, Forced Entertainment’s multi-layered collage of images demonstrates once again how adept we are at constructing narratives from solitary building blocks. As a new piece of theatre, however, The Last Adventures falls short of the company’s best. In its chaotic exploration of stories it is almost a visual embodiment of The Coming Storm, perhaps best viewed as a companion piece to that earlier show. The usual exquisite silliness is all there, as are many other of the increasingly legible outlines of Forced Entertainment’s performance language. If The Last Adventures extends the company’s vocabulary at all it is through Atoui and Null’s joyfully disruptive sound design. Sudden beats or new rhythms can distort stage images as soon as they form, contorting meaning and chasing the performers in circles. The theatrical meaning machine that Forced Entertainment have so revelled in tinkering with gains a new lever, perhaps not transforming it but, as the company celebrate their 30th anniversary, putting an interesting new pressure on its now familiar workings.